“Eight squadrons of (Vitellian) horse and probably three-quarters of the foot were sent to protect Forum Julii. The rest augmented by the (local militia) cohort of Ligurians and “500 Pannonians not yet under the standards” (raw recruits), were ordered to deal with the Othonians. The two sides made contact in a relatively small plain on the coast, probably near (modern-day) Menton (some six miles west of Albintimilium). The Othonian line faced west: on the foothills on the right-wing they positioned a mix of marines and local inhabitants (perhaps pressed, perhaps volunteers). 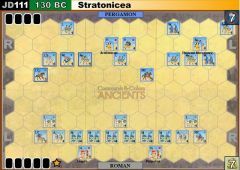 The (Othonian) praetorians occupied the center, on the flat ground between the hills and the sea. And for their left wing they used their ships with their prows turned toward the shore (the opposite of normal practice). Since there is no mention of the urban cohorts, they may have been held in reserve, but they were more probably embarked on the ships. They would have made real the threat to the Vitellians’ (right) flank. For their part, the Vitellians positioned the cohort of Ligurians on the foothills, to make up their left wing, drew up the Tungrian (auxiliary infantry) cohorts they had with them in close order on the flat ground. But since their strength lay in cavalry, they made the Treveran horsemen their front line (the Treveri were considered among the best cavalry in the Roman army). (The above selection is from “69AD: The Year of the Four Emperors” by Gwyn Morgan pages 105 & 106). 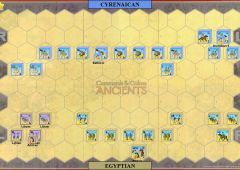 5 Banners for each side - scored in the normal fashion, however the Othonian Player receives and retains 1 banner if one of their ship units with a Medium Infantry unit still aboard occupies hex A13. 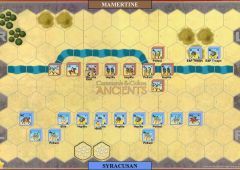 Additionally the Vitellians score and retain 1 Banner if their units currently occupy both hexes I10 & I11. 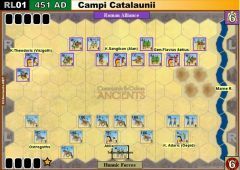 Command Rules: A Leader attached (stacked with) a friendly unit may cancel one sword hit on the unit in lieu of canceling a retreat hit. A unit involved in close combat with the support of a Leader may only count one helmet hit amongst those rolled to inflict a hit on an opposing unit. A unit is said to be “Outflanked” if it is surrounded in all six adjacent hexes by either enemy units, or hexes adjacent to an enemy unit. 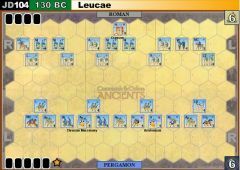 The presence of friendly units does not negate an “Outflanked” situation in any way. 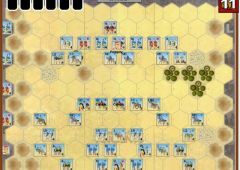 Units on the board edges (and not surrounded by six adjacent hexes) cannot be “Outflanked”. Othonian Marine Light Slingers: The Othonian Light Slingers are Marines put ashore from the Othonian controlled Roman Misenum fleet, when firing their missiles at Vitellian foot units at a range of two hexes or less they hit on swords—in battle back only they also hit on swords regardless of opponent. 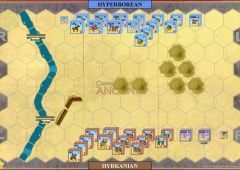 Othonian Marine Light Slingers located in a hill hex may fire over units of either side located in clear hexes. Ordered Marine Light Slingers may even missile fire at adjacent enemy units in lieu of attacking them in close-combat. Othonian Marine Light Slingers may evade through a friendly unit, as long as the friendly unit is located in the first hex of their evasion path. 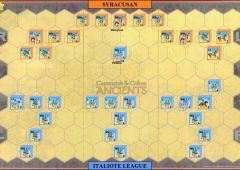 Othonian Praetorians: The Othonian Heavy Infantry represent detachments from the Elite Praetorian Guard: the so-called ‘flower of Italy’. Such units always ignore the first sword hit inflicted upon them in close-combat and battle-back. 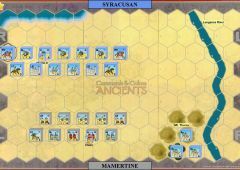 Ships of the Misenum fleet carrying the Othonian Urban Cohorts out on the Mediterranean Sea are represented by three Othonian ship units that initially start in hexes D11, E12, F12 in both battles. Each of these ships is assumed to have an Othonian Medium Infantry unit aboard at the start of each battle scenario. These sea-based forces caused the Vitellians some trouble in the first battle when they tried to advance near the sea and probably were also used to threaten the retreat route of the Vitellian cavalry. Each of the ship units and troops aboard is represented in the game by four blocks of the appropriate Type (Medium Infantry) representing the Othonian Medium Infantry unit aboard as ‘cargo’ and a single ship model representing the ship and its remaining crew—“The Conquest of the Empire” game by MB/Eagle Games has some plastic models that could be used to represent the ships. Use the following rules for these ship units and the initially embarked medium infantry—in general, for game purposes, except where noted below, the ship units are treated as, and are ordered & move as Medium Infantry units, but with a missile capability. a) The Othonian Ship units may not enter seacoast hexes. 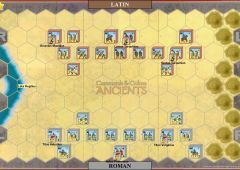 Although they can unload their embarked Medium Infantry units into seacoast hexes (see below). The movements of the ship units are confined to the sea hexes listed above in the terrain set-up. b) The Othonian Ship units and any units they carry aboard as ‘cargo’ cannot be attacked at all—not even by Vitellian missile fire. 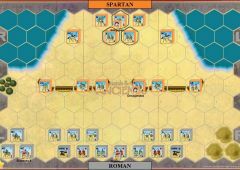 Othonian Ship units, and their embarked Medium Infantry may never close-combat attack. c) Othonian Ship units that still have a Medium Infantry unit aboard may missile fire if ordered—their missile range is three hexes. Missile fire is conducted per the normal rules, but may be shot into adjacent seacoast hexes from the ships. Ships without the Medium Infantry aboard may still be ordered to move, but may not missile fire. d) The Othonian Medium Infantry units that start initially aboard the ships stay with the ship unit they are aboard as ‘cargo’ until unloaded. Ship units may unload the Medium Infantry into an adjacent vacant seacoast hex. This can only be done if the ship is ordered via a card and remains stationary without missile fire—Place the Medium unit in the adjacent seacoast hex—it may not battle on the player-turn of its landing. 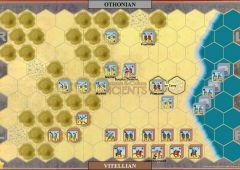 Once ashore the Othonian Medium Infantry units operate normally as regular Medium Infantry, they can now attack in close-combat and be attacked by the Vitellians and may not re-embark. 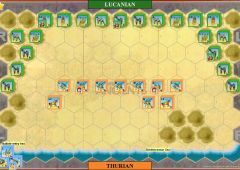 Obviously the initially embarked Othonian Medium Infantry units (representing the Othonian Urban Cohorts) cannot be disembarked into sea hexes. Once ashore the Othonian Medium Infantry units have no missile capability. e) Othonian Ship units and any embarked units carried as ‘cargo’ may not be ordered by play of Line Command, Double Time, or any Leadership cards. Disembarked Othonian Medium Infantry units may be ordered by such cards once ashore. 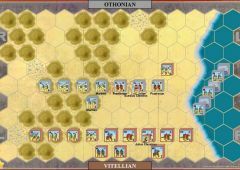 f) Othonian Ship units, with or without embarked Medium Infantry can offer support to Othonian units on adjacent seacoast hexes. (Exception: see surprise rules in the second battle). 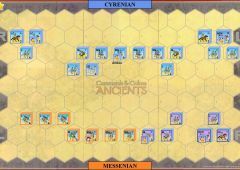 Seacoast Hexes: Othonian ship units may not enter seacoast hexes. 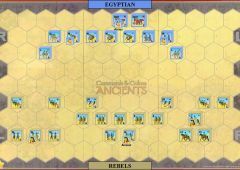 All other units/leaders may conduct ordered moves into such hexes, but only if ordered from an immediately adjacent hex. Seacoast hexes do not otherwise affect line of sight, retreats, momentum combat, close-combat/battle-back, or evasions. 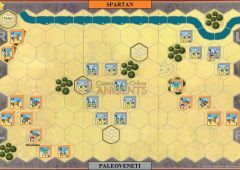 Sea Hexes: Sea Hexes as noted in the terrain setup are totally impassable for all units/leaders in the game save the Othonian ship units and any embarked units aboard them.